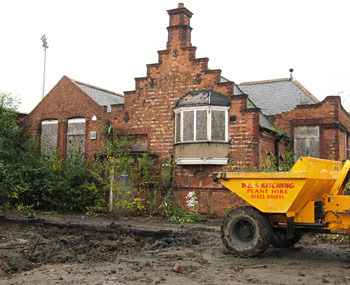 Another building awaiting redevelopment is Shipton Street School, alongside the football ground, in the Bootham/Clifton area. It has been empty for years. It appears that the proposed development was given planning permission with an expiry date of 21 Oct 2012 for work to begin. Which perhaps explains the recent appearance of machinery on the site. The school is surrounded now by housing, nestled in the middle of these terraced streets, with the stands of the football ground tight up to its other boundary at the back. When Shipton St School was first built, in 1890, it had a rather more open aspect. The maps show it with nothing immediately alongside it, and no buildings to the front for some distance, the open space of the cricket ground behind. Back then it looked out onto what was still an open field. 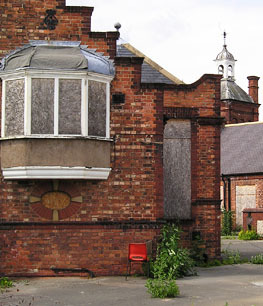 Development had taken place between the school and the railway line, with Scarborough Terrace, Filey Terrace and Grosvenor Terrace to the east and south. Most of Newborough Street had been built, with Pickering Terrace leading off from it towards the school playground. Within the next ten or twenty years the terraced streets opposite the school had covered the open field, beyond them stood the new streets of terraced housing off Burton Stone Lane. Much of this was presumably housing workers at the Rowntree’s factory between Haxby Road and Wigginton Road, just over the other side of the railway line. Their children would have attended this school at the heart of the newly built-up area. We call it Shipton Street School, but it used to be referred to as Shipton Street Schools, plural. It catered for ‘Boys, Girls, and Infants’. The infants used the small school building in the playground area, on the left of the photo. The 1891 plan has a clear dividing line down the middle of the main school building and its playground, one side for girls, the other for boys. There were still children playing out there – no longer segregated by gender, I assume – more than a century later when we moved into the area. I could hear them shouting and laughing in the playground sometimes, voices carried on the breeze across Clifton rooftops. The school closed in 2002 and has been empty since. 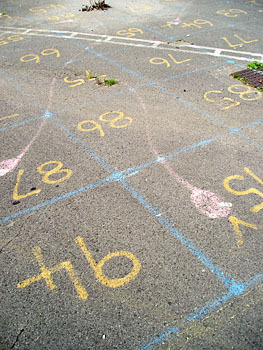 When I had the opportunity to trespass briefly through a broken gate, five years ago, the playground concrete was still decorated with painted numbers and squares, and compass points. Today it was all mud and rubble. In the corner closest to the stands of the football ground were signs of a slightly deeper digging, with trenches in rectangular patterns. These must be I think the foundations of one side of Pickering Terrace, where bombs fell and a woman died, on the night of the Baedeker raid 70 years ago. 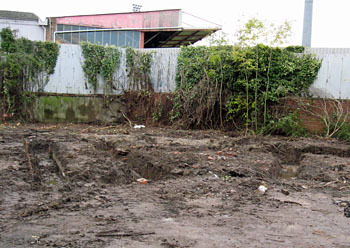 No sign of that short street now, just these muddy foundations, soon to be covered with the foundations of another generation’s building. Already gone is the playground painting of snakes and ladders. If all goes according to plan there’ll be houses here, and parking spaces, neat white lines on tarmac where there used to be a pink snake on concrete. Let’s hope the young people who might want to buy a house here can get a foothold on the increasingly slippery ‘housing ladder’, and don’t meet too many snakes. my late father and his brothers and sister all attended the school as children, back in the early 1900s. they lived in Scarborough Tce. They all lived in York as adults except one, who went off to live in Kent. It gave a good grounding to children then. Leaving at 13 and 14 and moving on to work of course. One made it to Grammar school. One became a famous Pathfinder in the RAF in the war, two others served in the Airforce and Army. One became a Bank employee and 2 became Mechanics on owning his own small garage. Now sadly all deceased. Im the daughter of one, im now 84 and living in the USA in my later years. a good shopping centre too. work was there for most people who wanted to work also. It was a great place to live.